This is a very low quality Mezuzah, (I have to check several similar to these) if you see the י of והיה it looks almost like the letter J on an angle. It does not have a Rosh and instead a hook for a body. I assume it is shinui Tzura, I would appreciate your opinion on this. I forgot to mention that the Nun of Einecha also seems to be a Shinui Tzura. I'm very interested in what Rav Moshe or Rav Eli say about this. I seem to recall asking a shaila on these kind of yudim and, although I don't have the sources off hand I remember being told that a minor J shape isn't much of an issue, the big problem is when they look like mini kafim, which I think I recall from R Shlomo Mualem's book Yeriot Shlomo is only really an issue if a) the proportions of the yud are such that it have a gag and moshav clearly defined that are more than 1-2 kulmusim length (depends on the ksav of the sofer) and b) if the moshav extends past the line of the gag. the nun is kosher, any tinok would read it a nun. the yud is very problematic, it doesnt get to a minor caf, and that that it resembles a J is also not a pasul. But, hanging in the center of line (and on a slant) not aligned at all with the sirtut, causes a problem. I recall a psak of sheivet halevi of a big yud that fills the line, although the yud itself was OK, it didnt fit with the other csav - the letters, and seems to be a word by itself [like the big Ha of Hal'hashem in Haazinu (this is my addtion as example)] and Rabbi Wozner passeled it. this case may have the same law. obviously if the sofer is known, and the csav in general is alright only this happened (quite queer) then i guess we would try to fix the yud, to bring in line - if possible??!! Personally I would fix it. 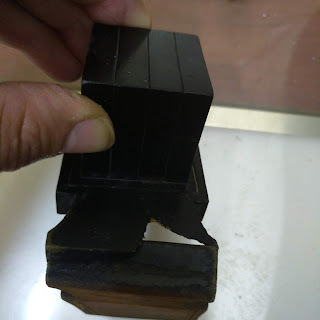 its fixable because its not an inyan of lo kesidran, i would just add ink and bring it up to the sirtut. I do this tikkun very often in cheap mezuzos. speaking of large letters, does anyone know of a mesorah to have a big ches in the word vayechal from the vayechal moshe kriah that we lain on fast days?? I've never heard of it nor seen it. Sefer Katan VeGadol by Rav Tzvi Ron which lists all the big and small letters in tanach has no mention of it. 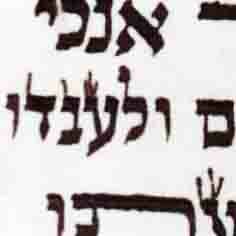 Dovid wrote on another page: "See The Sefer Osios HaRav from Rabbi Moshe Weiner page 169." I think this comment was meant for this page. In Osios Harav there, Rabbi Vozners psak [I mentioned above, about a big yud in the middle of a word] is mentioned, then questioned, one of the questions there is from a known psak (sources in osios harav p. 246-7) in regard to the word פן that the pei and nun are equal in the length causing a question on the nun, the psak is that the nun can be fixed/lengthened. 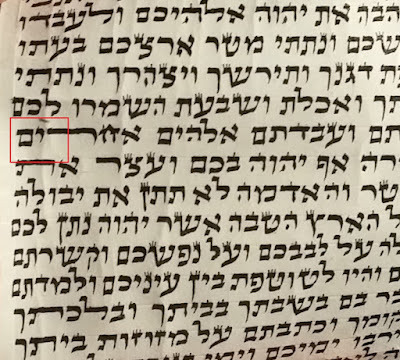 Accordingly I understand Dovids comment, that the point i wanted to say - this yud doesnt fit in the word, isnt a problem since it can be fixed, as Eli wrote. I admit they are correct, in this equation. But in regard to the "can of worms" it is a problem, it is obvious to my sight that this 'sofer' didnt learn to write. He tried to start the yud from the sirtut - but nebach thought the yud starts from the tag, he is trying to start the tag from the sirtut (see all the yudim). After the clear indication what type of 'sofer' wrote this mezuza, I have a practice in such cases, if there is a pasul although it can be fixed, not to fix it but leave it as pasul, and tell the person the mezuza is pasul. Why do I have to fix a word, when I doubt it wasnt written kosher in the first place?! What you are saying is very interesting and it is such a common problem today. In the case of Kotz DeRebeinu Tam for a Yud (at least for an Ashkenazi), the very low quality mezuzahs are commonly (rounded) on the bottom and to fix each one would be extremely laborious and risky. Can we apply this same idea to such a case. G-d willing I will send a picture of such a Mezuza. Dovid did i understand your comment correct in replacing the comment here? I dont understand correctly your question about the koitz RT. If it is sfardi csav maybe its OK, but ashkenazic csav deliberatly leaving out koitz RT, did he learn his lessons or he is making up a new csav?! I did intend my comment in the other post. if you meant that one or two yuds are lacking the kotz, because the sofer hurried and forgot, OK the hallacha permits to fix them. but if many of the yudim lack the kotz something is wrong with the sofer! !